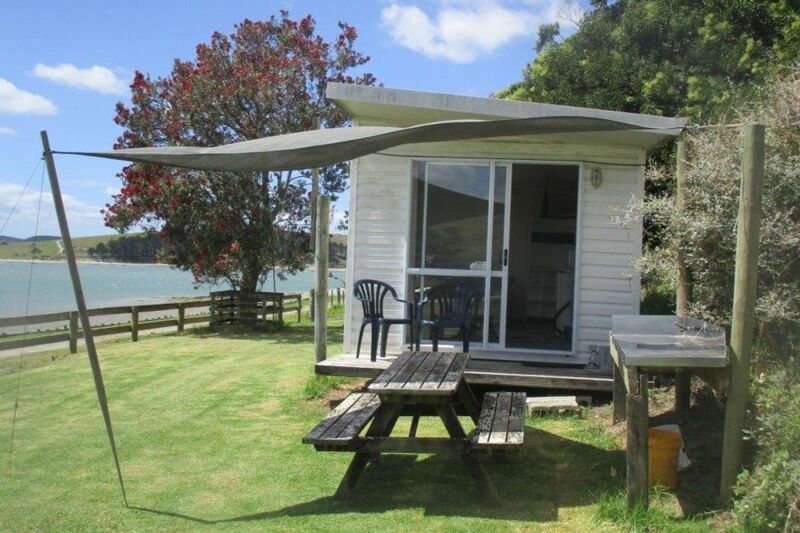 Retreat at Batley on the edge of the Kaipara Harbour. Protected from the prevailing wind and includes everything for your stay - kitchen equipment, fridge, cooking facilities, gas-heated shower. You'll be on a peninsula that's a sheep and beef farm and near historic Batley House - we think it's the oldest home on the harbour. You can enjoy coastal walks up and downriver and it's safe to swim (best near high tide). Fishing's great - off the beach or nearby point and there's a boat launching ramp. The harbour's a snapper hatchery - we rarely come home without a feed. There's parking space for your boat. Negotiable: tent for extra guests; dogs if they meet certain conditions. The area is rich with history - the house, built in stages from 1866, was a store, post office, and boarding house. There were fish factories and a flour mill here. You can walk upriver to Tanoa and an historic church where there are more historic yarns to be told. Rae's book, 'Love at the End of the Road' (a copy's in the cabin) tells the area's story. You may have seen the farm on Country Calendar and Marcus Lush's 'North' programme - he's a descendant of the first settlers. Cellphone coverage is patchy. Wifi - you might need to come up to the house. Separate shower with gas hot water. Spotlessly clean public toilets nearby (think glamping). Batley is about an hour and 40 minutes from Auckland, 30 minutes from the Brynderwyn intersection on SH1, 18km/20 mins from Maungaturoto, and about an hour from Whangarei, Dargarville and Warkworth. Pets okay with prior approval, e.g. your dog needs to be friendly (our elderly dog will visit), live outside all the time and be vaccinated - our kennel has indoor/outdoor flow. Fold out bed for child or extra adult. One tent okay with prior approval. Public toilets 40m. Wifi patchy but good at the house.. Cellphone coverage patchy but possible. Any questions or queries - please just ask. The farm has been in the Roadley family since 1912. Rex is the farmer - he loves fishing and playing bowls. Rae is a writer and author who likes horse riding and reading. Rex likes reading as well. Rex's grandfather spotted this property from a ferry that was taking him back to Auckland after he'd looked at another property. The house was build in three stages: 1866 - one level home; 1878 - two-level boarding house right next door; 1905 - the two buildings were joined and a full second storey added. Rex bought the farm and house from his father and uncle in the 1980s. We've done various renovations, but much is original. You'll feel as if you're at your own private beach. Things to do: beach walks, safe swimming, enjoy the native bird life (lots of people comment on this), good fishing from the beach, boat ramp, glorious views, or just chill - it's a quiet and relaxed place to be. Sure, there are visitors - but not every day. People launch boats from further along the road when the tides and wind make for enjoyable boating and fishing. Your dog is welcome - but discuss this with us first. We have a pen which sits on the cabin deck as dogs must be outside all time. Needs to be well trained and not a cat or livestock chaser. You'll be on a 1000-acre beef and sheep farm. Sometimes bulls and/or sheep will be in the paddock nearby. There's also a horse who loves carrots. Maungaturoto is 18km away - about 20 minutes. It has shops, cafes, organic shop, children's playground. Your cabin looks across and up Otamatea River an arm of the Kaipara Harbour. Walk about 100m to the point and you can gaze for miles towards the harbour entrance - great sunsets and gorgeous views. Batley Beach is near the end of a peninsula on the Kaipara Harbour. It's tidal and swimming is best at full tide. Boatramp - all tides. You can also fish from the beach. We have a DOUBLE KAYAK. Right on the beach - you're in the largest harbour in the southern hemisphere. Glorious view of the harbour. A few steps and you can fish and swim. In front of or beside the cabin. Wifi password is in the cabin. You might find it better to come up to the house. Password is in the cabin. Really good access from our deck which you're welcome to come up to any time. Variable at the cabin, we're told. About waist height with a small icebox. More plates, bowls and saucepans than you will need. Dine either at the table in the cabin - seats two or three - or at the table outside which seats more. My book 'Love at the End of the Road' about life here at Batley (pub'd by Penguin) and some others. Lawn all around the cabin. Double kayak with paddles. Yellow. It lives up at the house. Bring a tent for children: $10 each a night. Barbecue and shade sail. Outdoor sink. Have we told you about the toilet? There's a sparkly clean public loo 30m away. It'll be all yours morning and evening and most days as well. Spotlessly clean. We have a double kayak and lifejackets, etc. Dogs: Ask us first, must be outside (we provide kennel, and well trained. Wonderful overall experience. Fantastic remedy for urban living and working. I definitely would stay again and this time I'd get a 2nd hand fishing rod. Great spot for a learner fisherperson to have a go again and again around high tides. It was a pleasure having you here. Glad you loved it. Fishing in the Kaipara Harbour so often nets a great catch. And you're right - great place for a learner fisherperson. Look forward to seeing you again. Our second time here & we just can't get enough of the place! Thank you once again for letting us stay at your little gem! We loved every minute of it. See you again soon! Great retreat if you want to get away from it all and just relax. Thanks for the experience. Thanks so much for your kind words. Glad you enjoyed it here. Loved having you to stay. Amazing location and grand old historic house. Awesome spot, tranquility plus. Will go back. Thanks so much for the kind words. Delighted you loved our place. We look forward to seeing you again. At Maungaturoto, 20 minutes from Batley: Playground, antiques shop, cafes, ATM, groceries, medical centre. East: a lovely loop drive taking in Waipu and Mangawhai: great beaches, shops and cafes. West: beach villages of Whakapirau and Pahi, famous Kauri Museum at Matakohe, further on to Dargaville and the wild west coast beaches.